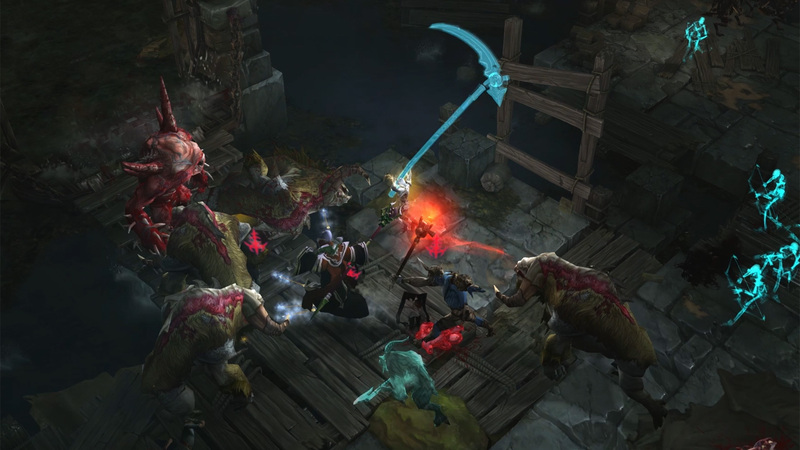 The old saying, “the more things change, the more they stay the same,” is perhaps a more than fitting description for Diablo 3’s newest character focused expansion pack. First enjoyed in Diablo 2, the necromancer class quickly garnered the nickname, “The General”, due to his ability to summon a rather large army of undead soldiers and mages as well as a golem made of fire or blood or steel. At the peak of the game, if trained appropriately, that version’s necromancer could be accompanied by ten skeletal soldiers, ten skeletal mages and a golem, making for an imposing, if almost unmanageable number of followers. 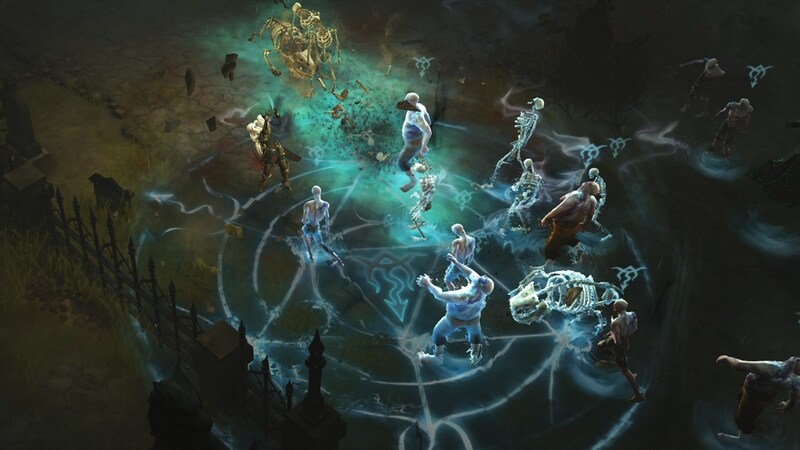 The evolution of the necromancer in Diablo 3 has nowhere near the amount of followers, but they display a more uncanny penchant for destruction, which can be focused even more with the copious use of runes. The class can now control seven skeletons at maximum and can command them to heal or whip them into a frenzy, using runes to bolster or offer them slightly different abilities if only on a limited, but reusable basis. One would be remiss here if there weren’t some comparisons to be made to the witch doctor, the game’s other, for lack of a better term, pet class. While the witch doctor summons zombie dogs as the base for itss army, the necromancer doesn’t summon so much as beckon minions from below. This means that skeletons, whether destroyed by enemies or your own maledictions will sort of “climb up” from beneath the depths when your army falls below its maximum undead quota automatically, without you having to manually summon anything. Perhaps this may seem a small detail to many, but for those who remember wading through hordes of enemies with a veritable caravan of undead in Diablo 2, and trying to micromanage and make sure you always had the maximum number of skeletons summoned at any given time, it’s a detail that is very much appreciated. From a certain perspective, the necromancer’s minions may seem more “controllable” than the witch doctor’s often seemingly mindless fare. There are several reasons for this. The witch doctor summons zombie dogs that can be imbued with different properties, such as the ability to heal or poison or burn, etc, but generally they attack whatever they come across, and can also be detonated at will by the creator. Their skeletons, similarly also are rather efficient enemy dispatchers, and tear into whatever enemies lie in their paths as well, and in a similar fashion, can also be detonated at will. The simple and perhaps innocuous act of being able to command your minions to frenzy or freeze targets or heal you for every strike they perform may not seem significantly different from the witch doctor’s minions, yet the very act of being able to command them at all represents a fundamental shift and one could perhaps make the case, something of an evolution in terms of the inner workings of pet classes in the world of Diablo. Your other controllable minion, the huge, hulking golem, that can be crafted from flesh, blood or ice, can also be commanded in several ways, like freezing a group of enemies solid or collapsing into a pile of usable corpses. The main difference between your golem and your skeletons is the fact that ordering your golem to do something has a 45 second cooldown while your skeletons suffer no such limitations and can be ordered about as long as you have a valid target. The other staple from Diablo 2, the skeletal mage, has perhaps undergone the most changes, much to the despair of the community. Instead of the summonable minion that would hurl bursts of fire, ice, lightning or poison gleefully at the hordes of enemies in Diablo 2, the new incarnation is a simple summon that appears, attacks and vanishes in 2 seconds. Even though this limitation can be extended to fifteen seconds, it has promoted an outcry from the Diablo 3 community on the official forums. The developers even addressed the issue in several rather lengthy posts, citing many good reasons, in regards to gameplay balance, why the skeletal mage had gone from a follower to a limited time spell. Speaking of gameplay mechanics, playing as the necromancer, is all about essence. From a narrative perspective, this class is all about the cycle of death and rebirth, in the form of energy. To this end, it revolves around using essence to cast abilities, and then regaining that essence, either from corpses or directly draining it from enemies. 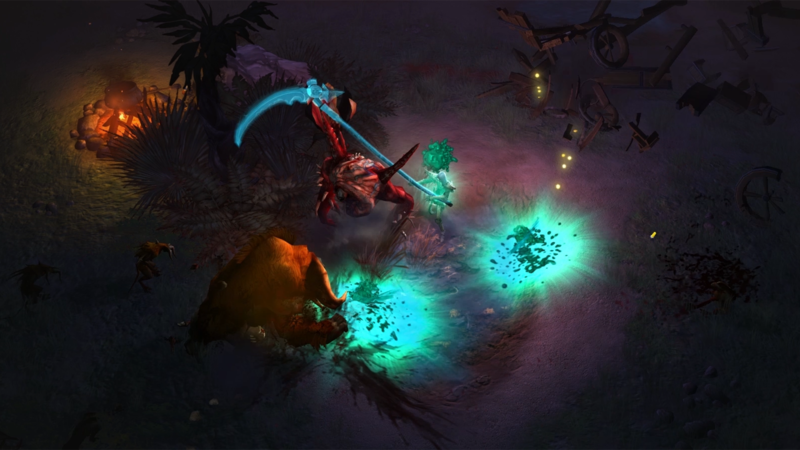 Since essence, unlike other classes’ resources for abilities, is non renewable, meaning it doesn’t slowly recharge over time, many of the necromancer’s fundamental abilities replenish essence, as a side effect. Narratively, this circle of energy absorption and release provides an interesting dichotomy when you reach the final act of the game, and the antagonist Malthael, as he’s slowly destroying the world by draining the souls (essence) of the living to fuel his own agenda. So, as a necromancer, you journey through Westmarch Commons, the surrounding swamps and ruins and temples, essentially, doing the same thing, only on a much smaller scale, and for the good of the world, rather than its downfall. The necromancer is also a study in familiarity. If you enjoyed playing as one in Diablo 2, you’ll find that he/she has changed very little, in terms of abilities. A servant of the bones, many of the skills you’ll rely on to speed your enemies onto the next life you may recognize, such as bone armor, bone spirit, and bone spikes, with interesting specialized additions, like the simulacrum, which creates a duplicate of your character, complete with secondary skills, and curses like frailty, which make groups of enemies much more prone to exploding once their life bar is low. Even though it’s an extremely character focused expansion, it also features around thirty or so necromancer-themed legendary items, including four new specific sets, several new set dungeons and a new misty moors themed area in adventure mode, leading to a large temple with many cultists, just waiting to be dispatched. Rounding out the package is a new challenge mode, where you are given a premade character build and a set time limit and tasked with clearing a dungeon in the time allotted, for often rather nice item based rewards. In the end, Rise of the Necromancer is a mixture of the new and the familiar. Like the cycle of energy that binds us, so too does the legacy of Diablo seem to come full circle, with this latest addition. Wielding a scythe and carrying a phylactery as a focus, the necromancer is an imposing figure, but one that’s somehow sympathetic, in that, with all of their command and manipulation of death, they are finally, painfully just as vulnerable to it as we all are. In a way, this class stands as a testament to the past, a spiritual commentary on the present, and a glimpse into a future that may be dark at times, but always features an inner light, if one knows where to look.